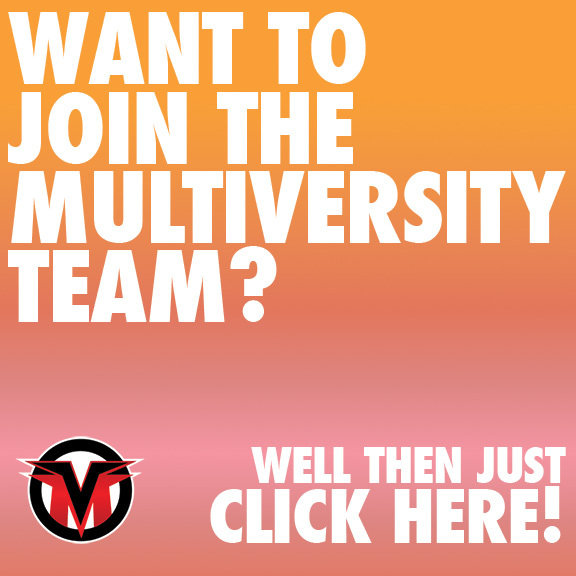 Summer is long behind us, but the Multiversity Summer TV Binge continues! Although I’ve never been what you would call an anime person, I’m a huge fan of Attack on Titan. I first fell in love with the subtitled version of the show, so I thought it would be fun to revisit the dubbed version. Watch along with me, but be warned, here be spoilers! The first half of this episode features only one familiar character, and one who has been missing for a long time: Annie Leonheart. After the Battle of Trost, she went ahead and joined the Military Police, a cushy gig given mostly to lazy rich kids. She’s the only one of them who has even seen a titan. Mostly they just navigate paperwork. Annie’s eyes are glazed over, and compared to the passionate Scouts, and the hedonistic MPs, she seems practically catatonic. We also meet Marlo, and his dumb hair. He’s got big dreams of cleaning up the MPs and rooting out corruption. When he discovers his superior officers selling their equiptment on the black market, he tries to stand up to them. It does not go well. The corrupt officers kick the crap out of Marlo, but Annie saves in and saves him by being absolutely terrifying. Lying on the ground, Marlo contemplates just picking up his gun and shooting the officers dead. Wordlessly, using music and animation, his frustration with the system is conveyed, and you can feel the moment when he realizes that he’s not going to be able to make a difference using the proper channels. But he doesn’t do it, half because he wimps out, and half because Annie is super scary. She tells him that maybe he should have. Without naming names, she tells him that Eren might have. And she’s absolutely right. All of a sudden, Armin is there pulling Annie into an alleyway. He wants to spring Eren from custody before he can be prosecuted and/or executed, and being Armin, he has a convoluted jailbreak plan that involves an MP. Annie is still dead behind the eyes, and refuses. Then Armin busts out the Ayn Rand Objectivism. Not explicitly, but he starts going on and on about how there is no morality, and people only do what they do to manipulate each other. “A good person?” Armin monologues. “I’ve never placed that much value on those sorts of labels. The way I see it, ‘good’ is merely a word applied people who are beneficial to our needs in some way. It’s purely subjective. Any way you look at it, labeling people dehumanizes them.” OK Armin, undergrad philosophy 101 called, and you got a C- on your term paper. Then again, maybe I’m selling him short because Annie agrees. The camera pulls back, and suddenly it becomes clear that all of the Scouts are lying in wait around the tunnel entrance. Then Armin starts his monologue again, but this time he’s got something smart to say. He lays it down casually, so much so that I didn’t even notice when my jaw had hit the floor. Annie killed Marco? And Sawney and Bean!? And she spared Armin? But that means that- She’s the Female Titan!! Without ever saying it, Armin connects all the dots and creates the narrative that Annie has been the traitor all season. The reveal is so understated, that it hits much harder than it would have with a big wham. Annie just slowly starts to smile, until it escalates to a huge laugh. She’s so happy she doesn’t have to hide anymore. The pieces start to come together, including the reason why Annie doesn’t want to go underground. But it turns out that everyone in the crowd is actually a Scout! They tackle Annie, and it looks like the day is saved, but her ring has a hidden barb on it! She draws her blood, lightning flashes and… to be continued!